See inside the Homeless Youth Resource Center. It’s just another Monday for the Volunteers of America Utah outreach team. Members spread out so they can cover more ground and find their target — homeless youth. The team members hop on TRAX, because that is a common place to find them. The next place they look is under overpasses or in parks. They just want to tell them that they have somewhere safe to go. Volunteers of America is a national nonprofit organization, which was established in 1896 by social reformers Ballington and Maud Booth. A chapter is located in Salt Lake City that has various human services programs, including homeless resources, detoxification services and housing assistance. A survey done by Volunteers of America showed that approximately 41 percent of the youth they served in 2010-2011 identified as LGBT. Although that number has varied slightly since the summer months, Zach Bale, vice president of external relations for Volunteers of America, said that a little more than one-third of the youth he sees are LGBT. The number is disproportionate when compared to the general population of LGBT in the Salt Lake City community, which is 6 to 9 percent. According to both the Utah Pride Center and Equality Utah, an advocacy organization for LGBT Utahns, there are two central causes to youth homelessness: a lack of recognition and acceptance on both the personal family level and by society in general. Recognizing that homeless youth exist, and realizing that there are specific reasons why they end up homeless, is a crucial step for initiating changes. According to the 2012 Comprehensive Report on Homelessness in Utah, released Nov. 8 by the Housing and Community Development Division, there was no representation of the LGBT community in both the adult and the teen categories. The survey included race, gender and age, but omitted sexual orientation. This is one main reason why the state doesn’t know how many homeless people identify as LGBT. Awareness of LGBT homeless people on the state level would enable places like Volunteers of America to receive more funding. “Awareness is half the battle,” Bale said. The homeless youth center on 655 S. State St., sees about 60 to 70 youth per day. In 2011, more than 1,000 youth were served at the center with basic needs such as accessing laundry services, food and hygienic resources. The Volunteers of America Homeless Youth Resource Center accepts a small portion of funding on the federal and state level, but the majority of funding comes from local and private donations. In 2011, Volunteers of America joined advocacy work with Equality Utah. The advocacy work was for the emancipation bill, which allows teens who are 16 and older to make legal decisions for themselves. And for many homeless youth this is a necessity. Lack of acceptance is another reason why teens end up on the street. Utah Pride Center houses TINT, the other downtown youth resource center in Salt Lake City where youth can come to access basic needs. Utah has the highest population of members of the Church of Jesus Christ of Latter-day Saints (LDS) in the nation — 62.2 percent of the total population. In a January 2012 Pew Research study on Mormons in America, 65 percent of U.S. Mormons reported that being LGBT should be discouraged by society. Birdsall’s mother has been into heavy drug usage for most of her daughter’s childhood. Birdsall feels she has no one to turn to, because the rest of her family members are LDS. She is bisexual and is afraid to tell them. Her aunt came out to her family as a lesbian and they refused to speak with her for several months. Birdsall uses the homeless youth center almost every day. Balken said that one of the reasons why these kids end up on the street is because they do not fit in with their biological families due to a lack of acceptance. The kids then look for a place they can be acknowledged for who they are, and the sexual orientation they identify with. They are either placed with a foster family through the state or they end up roaming the streets in search of shelter. Volunteers of America also has a homeless outreach program where staff and volunteers search for individuals and families experiencing homelessness. Outreach workers supply people with basic necessities such as food, clothing and other survival material. Meals are prepared three times a day at the center, often by volunteers who have purchased the food. To further help youth, Volunteers of America Utah has partnered with the Utah Pride Center. Each now refers clients to the other organization if staff feel people would be better served or feel more comfortable at the other facility. Volunteers of America also works with the Fourth Street Clinic. Youth are referred to the clinic when they are in need of medical care. This clinic allows uninsured and homeless individuals the opportunity to become healthy so they can work toward getting back into secure housing. “We’ve been seeing a lot of kids with kids lately,” Bale said. So the center has had to acquire supplies to help teen mothers in need. The Fourth Street Clinic gives homeless pregnant girls or women the prenatal care they need to give their baby a chance at a healthy life. “In an ideal world we wouldn’t have anyone to help, but that’s not the case,” Bale said. The Homeless Youth Resource Center is looking to expand. Bale said Volunteers of America is searching for a parcel of land that is big enough to construct a building from scratch and incorporate all of the plans for the future. Bale and a group of other staff with Volunteers of America Utah went to various U.S. cities such as San Francisco and Seattle to study and learn from larger cities’ youth resource centers. They found that several cities offer homeless youth employment training and specific skills required to get a job. Volunteers of America Utah hopes to offer something similar to help homeless youth get off the streets and transition into confident, self-sufficient adult lives. Transitional housing is another project that Volunteers of America is currently working on. The existing building was scheduled to be remodeled, but on Sept. 16, 2012, an accidental electrical fire destroyed the roof and most of the top floor of the building located at 556 S. 500 East in Salt Lake City. Two organizations, including the B. W. Bastian Foundation, have donated $50,000 each to support the project. Individuals will be able to live in the Transitional Home for Young Men until they get a job and are capable of supporting themselves. 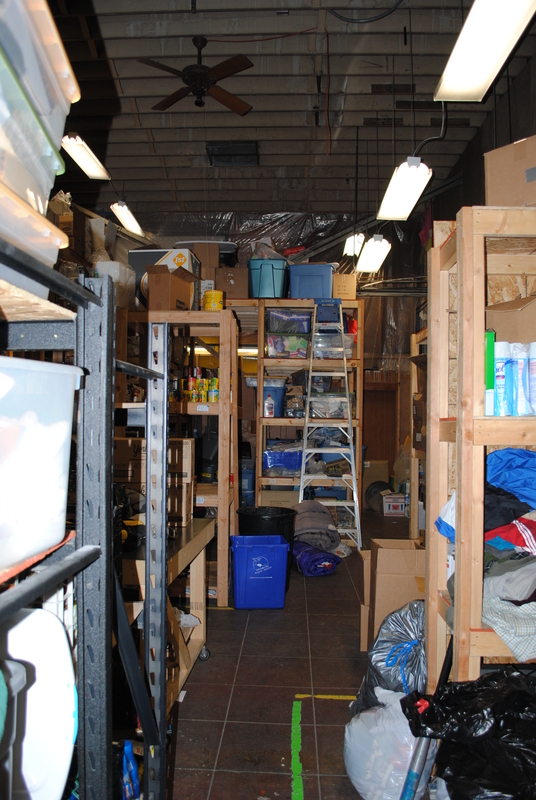 A look into the back room of the Volunteers of America homeless youth shelter in downtown Salt Lake City shows shelves of food, clothes and other items donated by people. Take a tour of the Volunteers of America resource center. In 2009, the Road Home, a homeless shelter based in Salt Lake City, helped more than 4,456 individuals. Statewide, 42 to 44 percent of the homeless population self-identify as LGBTQ+. This number of individuals is disproportionate compared to the overall population. About 6 percent of every population self-identifies as lesbian, gay, bisexual, transdender, questioning or another identity within this community. When most people think of homeless LGBTQ+, they usually get the scenario of a young person coming out to their families and then getting thrown out and are forced to live on the streets. However, Brandie Balken, the director of Equality Utah in Salt Lake City, said that is not usually the case. “When you think about the paradigm of… [coming] out to your parents and [getting kicked out] of the house, that’s the most extreme situation — not to say that it doesn’t happen — but that’s not the most common situation. Parents will frequently do things like ‘you can’t see these friends, you can’t dress this way, you can’t say those things’ or [they will] say things that are demeaning to folks who happen to be LGBT, and if that’s your own identity as a 13-, 14- or 15-year old, it’s unbearable,” she said. Individual identities are so fragile at those ages, and there’s so much going on in the lives of youth. To not be supported by family, their most intimate support structure, makes the situation become unbearable. As a result, many people choose to leave home altogether, Balken said. “They feel like it’s safer and they have a greater chance to explore their opportunities that way…,” she said. These individuals will frequently stay with their friends, doing what is known as “couch hopping,” or sleeping on couches and air mattresses because they can’t afford a bed. Eventually, they find themselves with no other place to go but the streets, Balken said. Many of these young people haven’t even come out yet, but they feel that the unsupportive environment is not something they can live with, so they leave. Balken said part of the contribution to the LGBTQ+ homelessness comes from a part in the adoption system that doesn’t allow any committed, long-term couples who are unmarried to adopt. This knocks out those couples as potential parents to children in need of foster care or adoption. “We know that some of our young people are not with their birth parents or not in a stable home because of their orientation or because they don’t feel supported in their lives by their parents and we have a system that doesn’t allow youth who identify as lesbian, gay, bisexual and transgender to be adopted into a family that could model for them what it is to be an adult and be that person,” she said. Intrigued with the process of becoming homeless, Natalie Avery created a documentary called “Outside,” which follows the lives of homeless LGBTQ+ individuals. This documentary followed four individuals for five years and was released in May 2012. Avery was a graduate student in film at the University of Utah when she began the project. “I was in my last year of graduate school and I learned about the issue of couch surfing.… I had never heard of it and I heard that the LGBT population was significantly higher than just the average and that when people were talking about homeless youth, at that time, they were talking about children of families, not invisible youth,” Avery said. Avery was inspired to take a deeper look into the issue of homelessness and highlight the lives of these individuals, the problems they face and how they handled them. Avery said she was surprised at how fast the fall could be from having a home to getting involved in drugs, finding a safe place to sleep or keeping warm in the winter, some of the many issues they were met with on the street. “There is this remarkable group of people out there trying to help [these youth] in different ways, particularly the Homeless Youth Resource Center which still exists and is getting stronger and doing a lot for LGBT homeless youth. I was really impressed with the level of service they were getting,” she said. Many youths take refuge in shelters like the Homeless Youth Resource Center, run by Volunteers of America Utah, located in downtown Salt Lake City. The shelter runs during business hours and offers refuge, hot meals cooked by volunteers, a donated clothing box and group activities to teach life skills and also bring the individuals together. From July 2011 to July 2012, the shelter served 1,264 homeless youth, and around 30 percent of those individuals self-identified as LGBTQ+. “Our hope is to meet the needs of youth and help keep them off the street,” said Zach Bale, vice president of external relations at the VOA in Salt Lake. The drop-in shelter bases its different services on the intake of individuals, mostly aged 15 to 22 years, and what their needs are, Bale said. The center allows youths to come in and get what they need, including showers and laundry, with computers just recently added to provide individuals with aid in job searching. Youth can select everyday clothing from the donations closet at the front of the shelter. A special closet in the back contains clothes suitable for job interviews. In addition to providing individuals with food, clothes and daytime shelter, a therapist at the shelter is available to work with youths each day to give them guidance and direction on personal matters in their lives. Tanya Ray is a certified counselor who completed a class at the Utah Pride Center where she learned how to be inclusive and friendly toward members of the LGBTQ+ community. While many may have the classic scenario of getting kicked out of the house after coming out to parents, many members of the LGBTQ+ community feel that leaving home is their best option as far as making their way in the world. Go on a ride-along with the Homeless Outreach Team. When Buddy Tymczyszyn and Kimberly Bell go to work each day, they don’t need to put on fancy clothes or stare at a computer screen. They don’t need to worry about office politics. But, during the winter, they definitely can’t leave home without their gloves. Just west of the hubbub of downtown Salt Lake City rests their quaint work center, housing a program that actively pursues a population with which few are familiar. Utah’s arm of Volunteers of America facilitates a Homeless Outreach Program that is constantly ready for action, equipped with a van-full of necessities, including food, water, beanies and blankets. A national, nonprofit organization, VOA has a presence in 44 states and employs a range of paid staff, who work to tackle issues such as homelessness and drug addiction. Tymczyszyn, 22, and Bell, 24, join forces to make up the outreach team. Together, the two pack up a van with supplies each morning to scan the streets of the west side for homeless people in need. “We do a lot of driving,” Tymczyszyn said of his 40-hours-per-week job in the field. Both began their posts with a “heart” for the homeless population. The team documents every shoe, scarf and bag of chips they give out in order to ensure that VOA receives adequate donations and its clients — the homeless people they serve — are given proper financial support. VOA’s donations come largely from the Utah Food Bank and individual donors. Clients will receive state funding based in part on the amount of services they receive from the organization. As Tymczyszyn and Bell traverse alleys and fields, searching for potential clients, they will often discover vacant tents, blankets or sleeping bags — evidence of a shelter. If the team reaches a “home” of someone who is not there, they will “water bomb” or “sock bomb” the residence, leaving a water bottle or pair of socks with VOA’s business card attached. “It helps give us a good name to them, so the next time we see them, they can recognize us or they can just give us a call from that number,” Bell said. During outreach missions, Bell and Tymczyszyn said clients’ reaction to them depends on their approach. Cliff Thurber, 54, has made the streets of Salt Lake City his home for several years. A regular client of VOA, he is an example of the established trust its staff strive to build, as he candidly spoke with Tymczyszyn and Bell like old friends. “They’ve given me food and good [conversation] and comforting thoughts, so that’s been helpful,” Thurber said of the two. Thurber moved from Provo to Salt Lake City, seeking a steadier income. He now sells the Salt Lake Street News, a newspaper put out by the Salt Lake City Mission. The nonprofit publication is specifically geared to help people experiencing poverty and homelessness. Thurber said he does his best to remain law-abiding in his lifestyle. “Police have never really hassled me,” Thurber said. “I’ve tried to stay above the law and tried to not do anything [illegal] — not be drunk in public places or anything like that. That’s not good,” he said with a laugh. Though several clients are experiencing homelessness because of job loss or negative life circumstances, some come to VOA with needs arising from addictions. One frequent client, Kevin Hansen, openly said he was on the streets because of a history of alcoholism. “I just love alcohol,” Hansen said, describing what he believes to be the ultimate reason for his homelessness. Bell and Tymcyzcyzn both agreed their job can be emotionally taxing as they build relationships with their clients and struggle with them through their situations. One goal of the homeless outreach team is an initiative they call harm-reduction. Tymczyszyn said the goal of harm-reduction is to try to get clients into a better situation immediately, working toward the deeper-rooted problems later. The team provides needle-cleaning kits and safer methods of using cocaine in order to minimize the adverse consequences of the drugs while coming out of addiction. “If they’re going to use needle drugs, how can they clean their needle to do it safely? If they’re going to sleep outside on the street that night no matter what, how can we try to help them stay warm in the process?” Tymczyszyn said. Despite challenges that come with the territory, Bell said her job is rewarding. This year marks VOA Utah’s 25th anniversary. According to its website, it boasts about 140 paid, professional staff who serve more than 10,000 people throughout the state each year. The homeless outreach team is in the field 8 a.m. to 5 p.m. Monday – Friday. “It’s the most incredible job in the world — I can’t believe I get paid for it,” Bell said.